Caution: Before you covet my globe, check with your parents, grandparents, or local thrift shop. Globes are underappreciated. 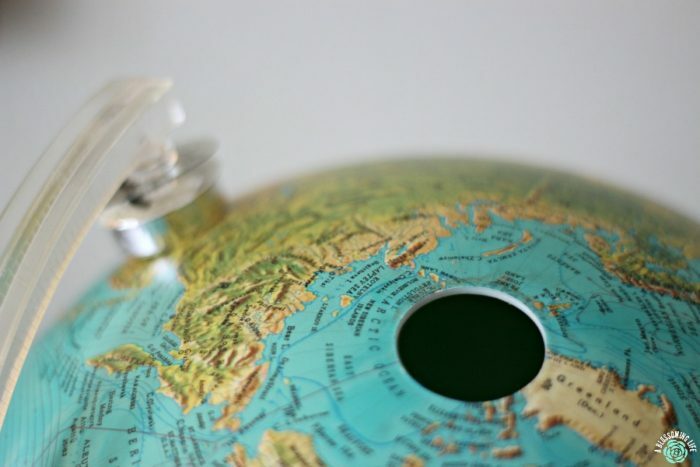 People, this is a sphere-wrapped map of the world! They aren’t always immediately gorgeous, but that’s where your creativity comes in. 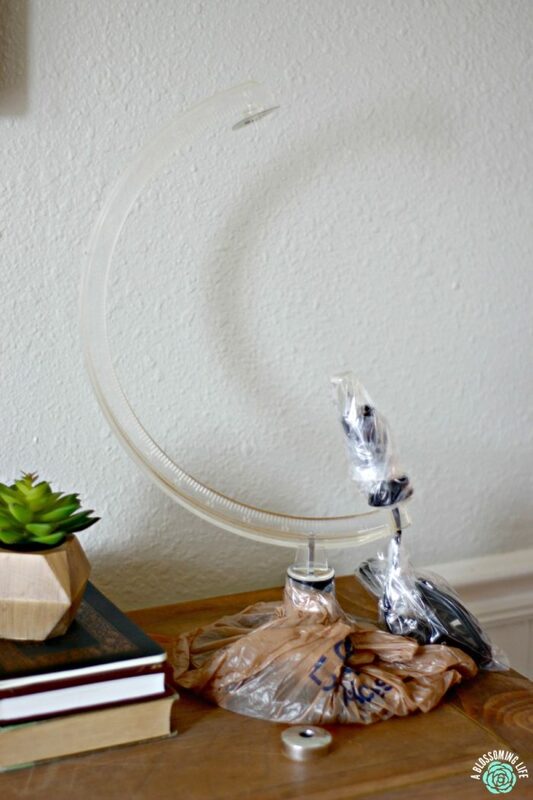 If you’re stuck, just add some copper to it. Really, I just ask myself if copper would make whatever it is look better, and the answer is usually “of course”. 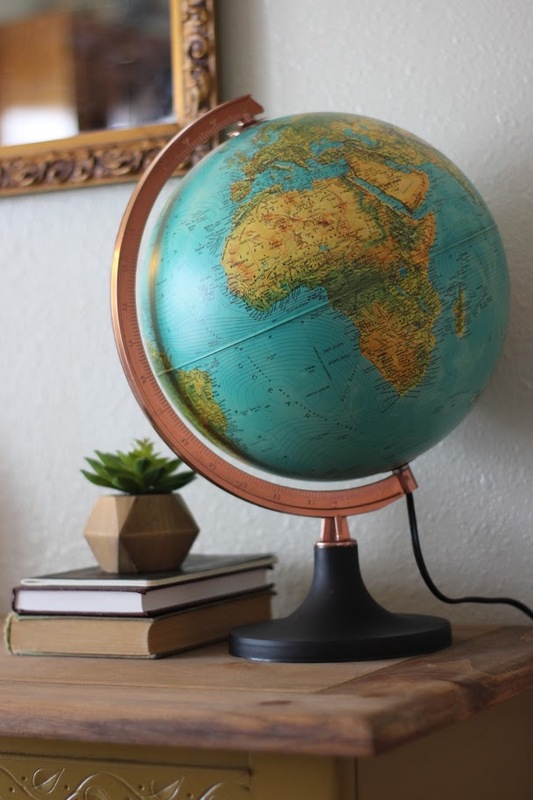 I got this vintage globe from my momma, originally my great-grandmother’s. I was really excited, but it arrived looking a little less ‘vintage cute’ than I’d hoped. No worries. 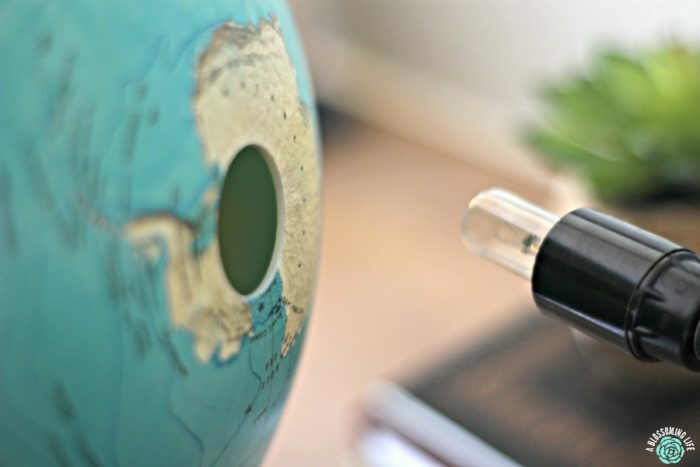 It’s a globe. It has potential. So, here is the globe in it’s unaltered state. Fresh from storage. I made a face when I saw it. Like, “…..oh.” The earth is breathtaking, so the arm that holds it ought not be so humble. Just pop the top off (be gentle to protect the map surface from any adhesive that might be in place), and lift the earth off the base. My base includes a light bulb, so that pulled right out. 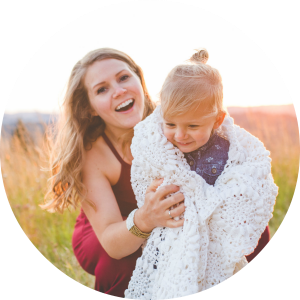 And just like that, you’ve got the whole world in your hands. I covered the surfaces not to be painted with plastic bags and tape. 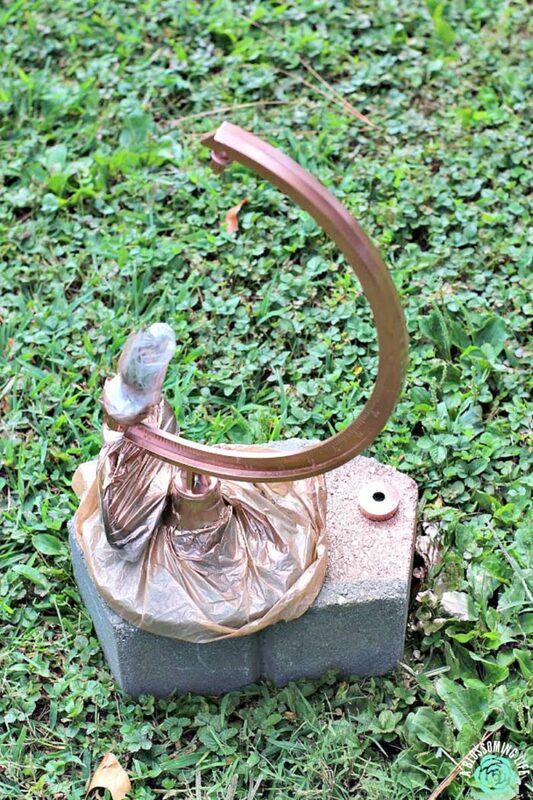 I took the base outside and applied two coats of Rust-Oleum Copper spray paint , allowing each coat to dry thoroughly in our blazing hot September sunshine. 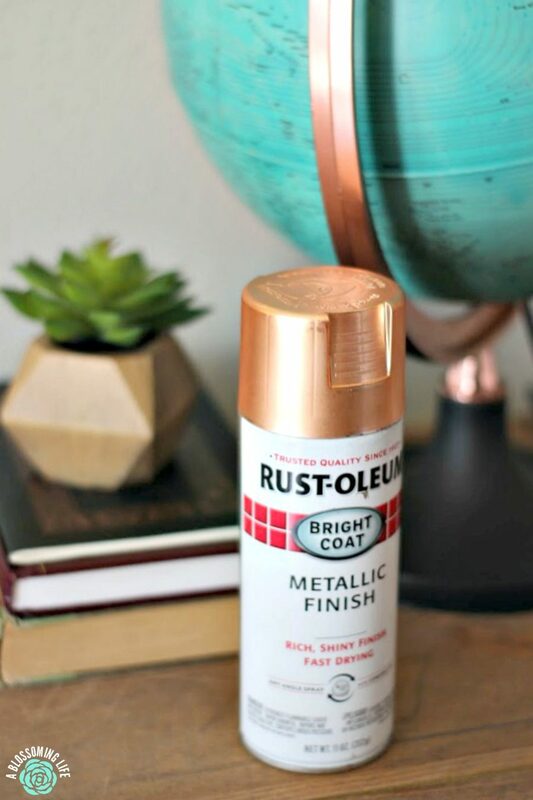 Why Rustoleum spray paint? I’ve used this paint on many items in my home, to find that it holds up well, covers thoroughly, and this copper color is to die for. 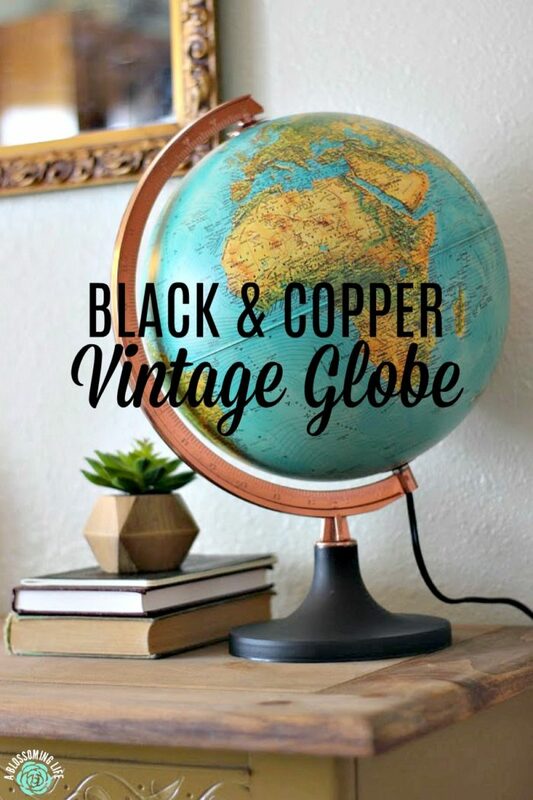 I have spray painted a magazine rack, a picture frame easel, a metal lid to a glass jar, an office organizer, this globe, and several other random items with this same copper paint, giving some bright pops of color throughout my home. Can I just say how thankful I am for spray paint? Where the only tool is my fingertip and the only clean-up is to store the can or throw it away? After I reassembled the globe, I set it back with my stack of books to look studious in my dining room. I absolutely love it. Didn’t it turn out beautifully? It’s one of my favorite things right now. 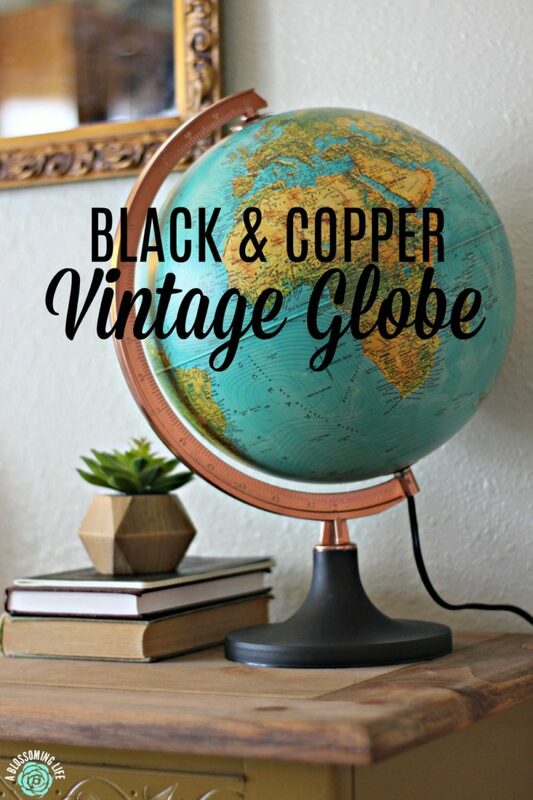 Black and copper paired with the bold colors of the globe itself add a lot of personality to the room. 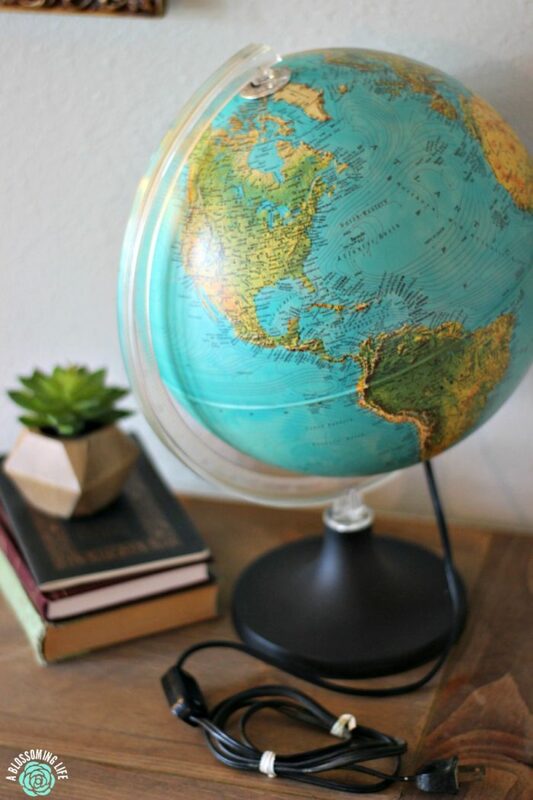 We’re moving our family to Texas in the near future, so I originally wanted this globe to point out Texas in relation to Illinois for my curious toddler. Now that’s it’s sitting so pretty on my buffet, I don’t think I’ve even given it a spin. C’mon, Libby. My decorating style is hugely comprised of pretty and practical. 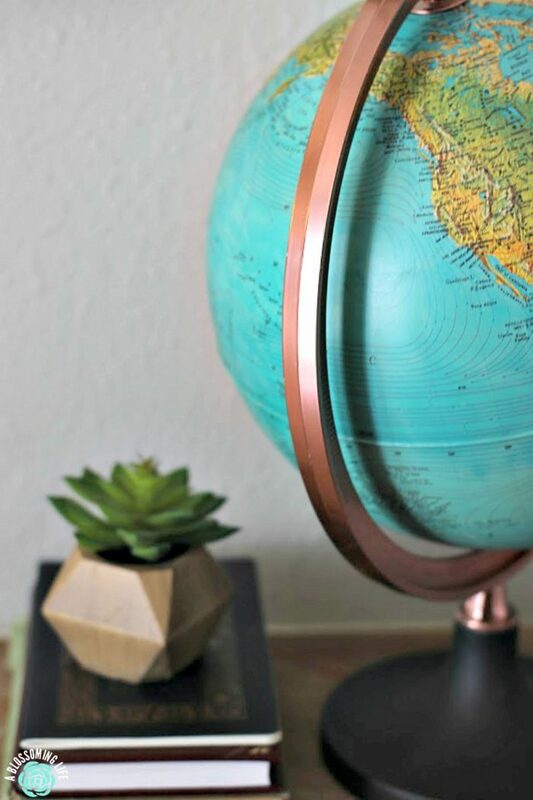 A gorgeous globe is the epitome of my style. If you’ve got $3 to spend, grab a can of this paint and pretty up something in your home.